Fuji non-reversible type air motors are compact and light weight, yet sturdy and offer high power-to-weight ratios. As Fuji non-reversible type air motors are less likely to generate sparks (unlike brushes in electric motors), Fuji non-reversible type air motors are better suited for use in hazardous environments. The locking handle are designed to reduce the risk of accidental starting of the tools. The handle is automatically locked when the operator releases the handle. The built-in Sleeve Valve allows the operator to adjust the blow frequency by adjusting the throttle valve. The 5412052226 Fuji Non-Reversible Type Air Motor is one of thousands of quality tooling products available from MRO Tools. 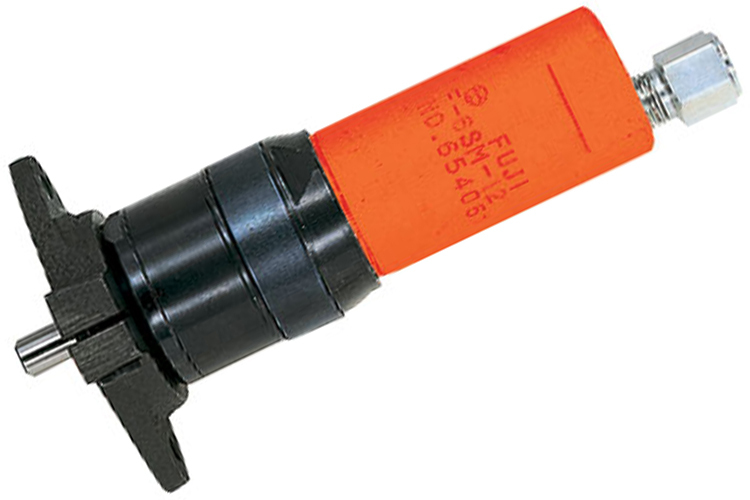 Please browse Fuji Non-Reversible Type Air Motors for tools similar to the 5412052226 Fuji Non-Reversible Type Air Motor. 5412052226 Fuji Non-Reversible Type Air Motor description summary: Fuji non-reversible type air motor. Model: F-8SMA-12 Type of Spindle: Thread Type (TH) Stall Torque: 11.8N.m/8.7ft.lb Power: 440W/0.59PS Free Speed: 1300m-¹ Overall Length: 200mm/7.87'' Quantity discounts may be available for the 5412052226 Fuji Non-Reversible Type Air Motor. Please contact MRO Tools for details.